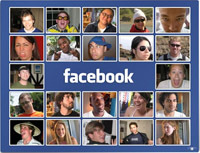 Facebook celebrates its sixth birthday by simplifying its home page and introducing other innovations to the social networking website. Facebook founder Mark Zuckerberg said the online community is hitting another milestone with membership climbing to 400 million this week. "So to celebrate six years of Facebook and the 400 million people on the service, we're doing what we like doing most -- building and launching products for people," Zuckerberg said in a blog post on Thursday. "It's rewarding to see that as Facebook has grown, people around the world are using the service to share information about events big and small and to stay connected to everyone they care about." The new home page began rolling out worldwide late Thursday. Changes include modifying the Top Menu to make it easier to find new messages, notifications, and requests. An Applications Dashboard will let members see the latest programs used by themselves or friends, and a Games Dashboard is dedicated for playing. "Whether in times of tragedy or joy, people want to share and help one another," Zuckerberg said as he looked back at the six years since he and Harvard University classmates created the social networking service.